Intel today showcased various Intel powered devices in its interactive “India Retail Innovation & Technology Tour” and demonstrated “Fast Easy Safe computing experience” on various devices powered by Intel’s 4th generation processors. These devices ranged from latest 2 in 1 Ultrabooks to Value PC and tablets with Android and Windows operating systems. Intel 4th generation processors are Equipped with Intel Quick Sync Video to facilitate easier and faster conversion of videos. 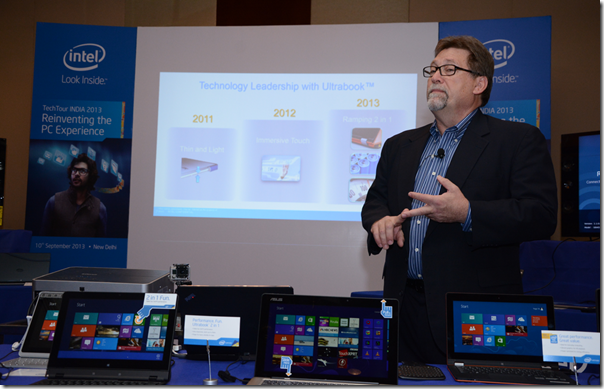 The session included showcasing of the ArcSoft ShowBiz, which is a Windows 8 UI application to produce videos quickly using the Intel Quick Sync Video feature. You can create videos in various different formats like Blu-ray, DVDs, 3D videos, etc and also inter convert them easily and quickly. Another advantageous feature is Intel Iris Pro graphics 5200 and 5100. This feature as the name suggests will enhance your gaming Experience with improved graphics. Codemasters GRID 2 was demonstrated at the event to showcase the significant improvement in graphics. A very important acheivent of 4th generation processors has been the increase in the battery efficiency. The new processor can save significant power and operate on as low as 6 W of power, simultaneously adding new interfaces through through touch, voice, facial recognition and gesture-based interactions. Intel will soon launch Intel Bay Trail 22nm System on Chip for mobile devices like tablets and smartphones. Intel has not yet specified weather we will be seeing the silvermount Micro architecture based SoC in smartphones any time soon. The silvermount technology is meant for low power requirements in market segments from smartphones to the data center thus providing with high efficiency. As battery is the biggest limitation of modern smartphones, such battery saving processors and technology is what we will see surface in the near future. Speaking at the event, Mr. Thaine Creitz, Director Consumer Channels Group, Intel Corporation said “2013 has been a special year for us, with the launch of 4th Gen Intel® Core™ processors and the Silvermont microarchitecture. These innovations have been a step towards revolutionizing the way we interface with computing devices through touch, voice, facial recognition and gesture-based interactions. With the launch of Bay Trail later this year, we will only take another step in making this a reality and the event today is aimed at showcasing how the consumer’s experience can be taken to the next level”.